Chick Lit Central: Meg Mitchell Moore is closer than ever...plus a book giveaway! Meg Mitchell Moore is closer than ever...plus a book giveaway! Meg Mitchell Moore is taking time out from her ultra busy life to join us today, and we’re super excited about it! With a B.A. and a Master's in English Literature, Meg was set up for success in the writing community, so it’s no surprise that after some successful years as a journalist, she’s now turned her attention to a burgeoning fiction career. She not only published "The Arrivals" right around this time last year, but she’s doing it again this year, with her latest novel, "So Far Away." As if that’s not enough, she’s currently working on her next novel, in addition to moving her entire family across the country (one husband, three kids, and a border collie). 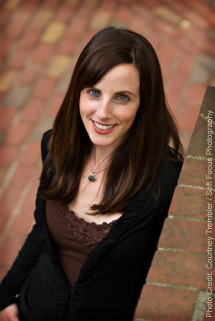 We’re so grateful that she found some time to answer some questions for us here at Chick Lit Central! Thanks to BookSparks PR, we have one copy of "So Far Away" to give away to a lucky US reader! You can learn more about Meg by visiting her website and following her on Facebook and Twitter. It’s early summer when Ginny and William’s peaceful life in Burlington, Vermont, comes to an abrupt halt. 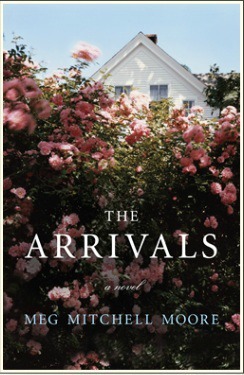 First, their daughter Lillian arrives, two children in tow, to escape her crumbling marriage. Next, their son Stephen and his pregnant wife Jane show up for a weekend visit, which extends indefinitely. When their youngest daughter Rachel appears, fleeing her difficult life in New York, Ginny and William find themselves consumed again by the chaos of parenthood—only this time around, their children are facing adult problems. By summer’s end, the family gains new ideas of loyalty and responsibility, exposing the challenges of surviving the modern family. And the old adage, once a parent, always a parent, has never rung so true. Thirteen-year-old Natalie Gallagher is trying to escape: from her parents’ ugly divorce, and from the vicious cyber-bullying of her former best friend. She discovers a dusty old diary in her family’s basement and is inspired to unlock its secrets. Kathleen Lynch, an archivist at the Massachusetts State Archives, has her own painful secrets: she’s a widow estranged from her only daughter. Natalie’s research brings her to Kathleen, who in Natalie sees traces of the daughter she has lost. What could the life of an Irish immigrant domestic servant from the 1920s teach them both? In the pages of the diary, they will learn that their fears and frustrations are timeless. What is the first chick lit novel you read? Why do you think chick lit is still alive and going strong? I think the issues chick lit faces are perennially relevant. Shopping, yes, relationships, of course, but also the act of making one's way in the world personally and professionally. The latter is something most chick lit heroines are wrestling with and for me that's the most interesting aspect of the genre. Which chick lit character would you want as your best friend? Andy from "The Devil Wears Prada." Or Bridget Jones, because I would enjoy having a best friend with an accent. Which chick lit novel would make a great movie (that hasn't been done yet)? "These Girls" by Sarah Pekkanen. Who is your favorite chick lit author (aside from yourself)? I adore Elin Hilderbrand, although I am not sure if she is officially included in the genre. And I can't wait to see what Jennifer Close writes next. Special thanks to Meg for visiting with us today and to BookSparks PR for sharing "So Far Away" with our readers. Please tell us about an experience you've had with bullying OR what you think can be done to combat cyber bullying. (One entry per person.) Please include your e-mail address or another way to reach you if you win. US only. Giveaway ends June 5th at midnight EST. I am a high school English teacher, so I see bullying. The worst is cyberbullying, because it isn't tangible in its meanness. But what it lacks physical harm, it makes up for in permanence. The first step in combatting it is for parents to force their children to take responsibility for their actions. Too many parents try to make excuses for their kids' bullying behavior. It's awful. Both kids and adults can be mean. I heard an adult jokingly call someone "autistic". I spoke up. No silence. I was cyber-bullied before that was the thing people did. Back in 6th grade just when AOL was beginning to get popular when people used dial up I signed on and received an instant message from soneone I did not know. They didn't have the option to accept or deny back then, so it just popped up. It said that the person was going to kill me. I reported the message over the internet and called AOL to report it as well. Over the phone they told me that the person lived in my neighbor hood and their name. Since this was such a serious threat they said that there account would be canceled and that they would report it to the police if my parents wanted. Being that the girl was my age we chose not to report it to the police, but my parents did call her parents besides AOL canceling their account. All these years later I still believe that stronger protection is needed online and more antibullying techniques need to be done. Too many people are losing their lives too soon over this issue! My daughter had a "bully" in her 7th grade class. It came to an end when her gym teacher witnessed the bullying and pulled the kid down in front of the whole class (about 50 kids) and said if you mess with Kirstin the whole class will mess with you. That was the end of it. I think more movies like "Bully" and just making students and parents more aware is important. There are too many parents that think (and say!) "Kids will be kids, they'll get over it!" and that just isn't true. I was bullied in elementary school by the group of people I thought of as my friends. It got so bad that I didn't want to go to school anymore - and I was one of those kids that loved school. Because they were my "friends" I was reluctant to let anyone know about it. It did eventually end but I can't recall how or when. I was the victim of a bully when I was in elementary school. This big kid used to punch me repeatedly on our recess breaks. It went on for weeks, till he got bored enough that I could run away and I just stayed out of his sight after that. It was like being trapped. I knew that if I told anyone they come down so heavy-handed that it would just get worse. Overall it was one of the worst experiences of my childhood. I was bullied in school because I was overweight... now, with cyberbullying, even cowards can be mean kids. It breaks my heart to see so many young kids driven to suicides because of this trend. I think people need to be more aware about cyber bullying. They should monitor websites like facebook. My mom and I saw my brother being chased by some bullies in our neighborhood, and we chased after them, but they got away. Never knew who they were, but they never bothered my brother again. We could use Parents of Bullies to show their children that it is awful to do! Name Calling, pranks and physical bullying hurts everyone. As someone working with special needs children, acceptance that we have more things alike than differences can happen. It is a lesson easily earned by pairing up the children. They can get along.Bullying must be stopped! Luckily no bullying experience in my life. Speaking up around bullying is a big start. i was bullied in elementary school. I am not sure what rumor went out, but one day, even the people who thought were my best friends ignored me. And I dreaded field trips, because nobody would want to be my partner. I think people need to be made aware of bullying and comments that are to bully people should not be posted or allowed. I am an elementary school teacher and I deal with bullying a lot. I teach my students to like each other and put their differences aside. we discuss how much hate there is in the world, and how much easier it is to be nice to someone than mean to them. I also tell them that they don't have to be everyone's best friend but they must respect everyone and treat them the way they would want to be treated. we also talk about how words can hurt sometimes more than being physical and sometimes those "boo-boo's" can last forever. I share stories of when I was in elementary school with them and of bullying, and saying and being mean, and how I remember those things more than the good things that happened. My friends child was being bullied at school we dicussed it and I told her to meet with the principal immediately. Which she did and things are much better.We have to be advocates for our children. Meg Mitchell Moore's new book couldn't come at a better time. Bullying is such a serious and major issue and cyber-bullying is becoming more and more prevalent every day. I think some of the problem is parents giving their kids too much freedom and space/privacy on the computer and phones. And those cell phones that are practically a mini-computer - oy! I think kids activity on-line has to be more strictly policed. I think schools shouldn't allow kids to use or even have the phones with them during the school day - copllect them at the door every morning and return them at the end of the day. I also think there needs to be punishments or sanctions for cyber-bullying. Too often it goes unchecked and ignored. "So Far Away" sounds like a terrific book. I was very quiet in grade school and the older kids would pick on me when I was going through the lunch line. I was afraid to tell the teachers. I am so glad that there is more awareness about bullying now. When my daughter was in Kindergarten she was bullied on the bus by a nerdy little 5th grader. Too bad he got a taste of his own medicine when he went to middle school. Karma! I'm a middle-school teacher, and although I did hear the occasional jab about my being chubby, I was not bullied - however, not too long ago, I began seeing a pattern with two boys in one of my classes, where one was severely trying to establish dominance, and the other was receding into becoming a wallflower. I was astonished that this was happening, and decided to confront the student being bullied, first. I thought it was far more important for me to establish comfort, reassurance, understanding and (above all) self-confidence in this poor child being bullied first. I wanted to make him self-reliant and equip him with the ability to fend of any perpetrators or bullies in life. I began working with him to have him effectively handle the situation. The situation was quickly alleviated, and I saw that the bully was not really engaging in his usual taunts, but I realized he had still not desisted from calling the other student names. So one day, when in my presence he called the other student a nasty name, acting like it was funny, I stopped lessons for that day. I then proceeded to, in front of the class, tell the bully that the next time I, or any of his other classmates, heard him calling his peer a nasty name, I would have the students EACH pick a nickname they'd like to call him, and they'd be allowed to call him that name for the rest of the year. Trust me, I've never since heard him call the other student ANY names - and I've heard reports that he also leaves the other student be, even when they're outside the confines of the classroom. I'm a young and new teacher, so I do not have a lot of experience, and no great accomplished - but this little victory meant the world to me. A girl in my daughter's second grade class used to boos her around and tell her what to do. There were bullies when I was in school but it seems like things are worse. In my son's high school a boy had his jaw broken for taking a chair away from another lunch table. Unfortunately, we are dealing with bullies at my daughter's school right now. Have been for years, actually. My daughter is not your typical little girl, she is very independent and has her own way. Because of this, she has a hard time connecting with other kids and they don't understand her. She also has a family trait of pointing eyebrows (think Spock) and gets teased for it. I've started calling the principal every time there is an issue because I want to stop this bullying before it gets worse.